If you’re in the process of, or working with designers to create a brand guide, cyber high fives to you! You’re well on your way to creating a strong brand that can compete in an ever-increasing competitive market and we think it’s awesome that you’re taking your brand identity seriously and looking to the future (and not just to tomorrow’s coffee order). However, if this is something you’re yet to take on, don’t fret, because that’s where we can help… read on for some handy tips to help you understand why you need a brand guide and why it will benefit you, your staff, external suppliers and your business as a whole. WHAT IS the PURPOSE OF A BRAND GUIDE? A brand/style guide is essentially a document that outlines the look and feel of your brand, designed to ensure that anything produced for your business ongoing is consistent across the board. A brand guide isn’t in place to restrict your brand, but rather to point you and others involved in your business in the right direction, to keep your brand message crystal clear. Not having a guide, is like playing a game with no rules, and while bending the rules can be fun sometimes, where your brand is concerned, it means everyone running in different directions, rather than working like a team with a plan. Without a guide, the visual identity of your company can begin to fall apart and lose credibility and brand recognition in a competitive marketplace. 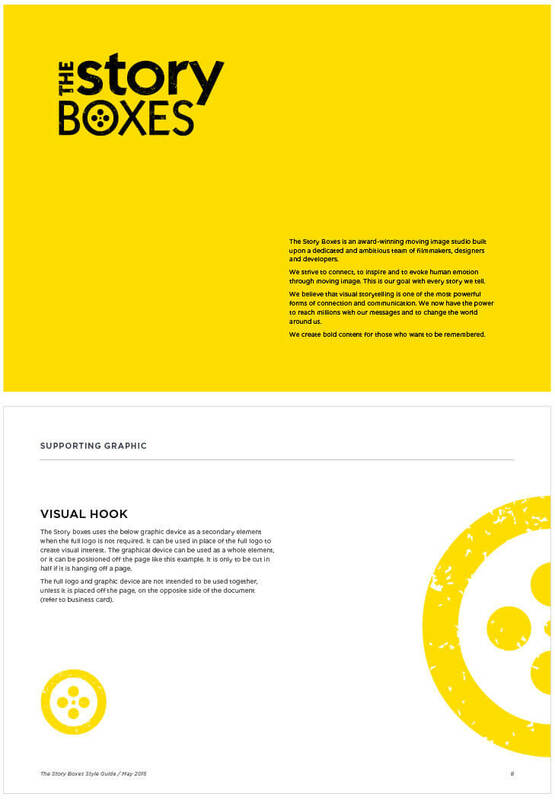 Internal staff members will reference the guide to ensure any in-house collateral follows the look and feel of the brand. 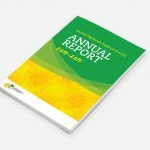 This document can also be given out to new staff members to give them a deeper understanding of your business and keep brand consistency within internal company documents. External companies such as printers, signwriters, web developers and graphic designers will use the style guide for a number of reasons; to follow correct colour usage (especially important for printers if you’re using Pantone colours), typographic standards, use of imagery and more. We’ve collected a range of examples from brand guides we’ve created and explain the ins and outs to give you a better understanding of what is typically contained in a guide. The first step of a brand guide is to introduce your company. This gives the reader a snapshot of your company values and tone of voice. Often larger companies will also include a note from the CEO, their core values, mission statement and vision. Another crucial step of in creating your guide is to outline the usage of your logo/s. This is one of the most important areas of the guide, because if your logo is used incorrectly, it can impact on the integrity of your identity. This should outline your primary logo and any variations (secondary logos) that you may have, where the logo should be used, it’s minimum size requirements, placement etc. 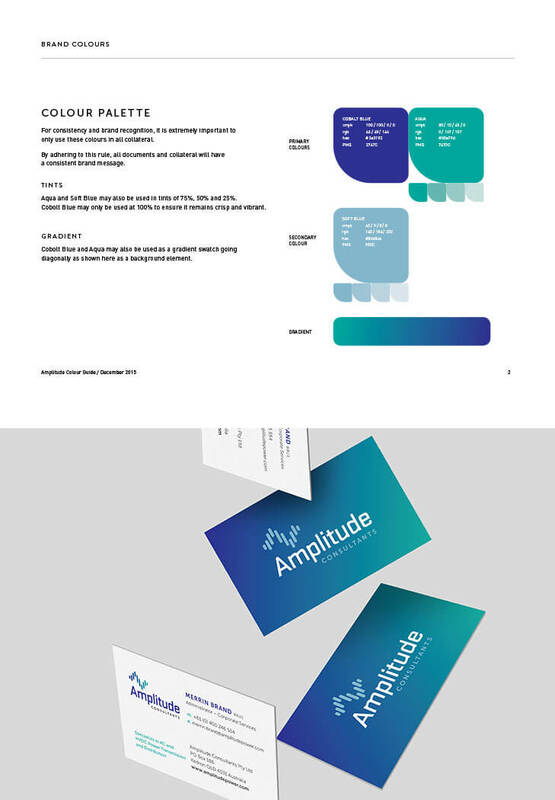 As you can see in the example below, in the Vanity By Design style guide we recently designed, both the primary and secondary logos are displayed and outlines their usage clearly. Whether your brand’s colour palette is bright and fun or neutral and a little more subtle, your colours need to be specified and used exactly as shown in your style guide in all printed and digital applications. Staying true to your brand colours helps with brand recognition and ensures your business maintains professionalism. Typography is another important element of your brand and should be outlined clearly in your style guide. We recently designed Principle Organs branding along with their style guide and website. 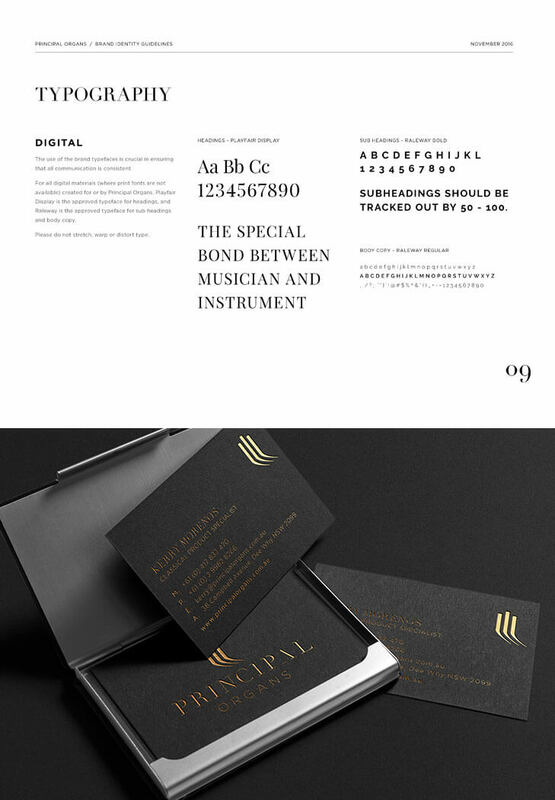 By specifying both digital and print fonts we achieved an outcome which tied all brand collateral together. On a side note, we love using a sophisticated serif for high-end brands! If your branding incorporates additional design elements, such as motifs, patterns or illustrations, it is also important to outline their usage. 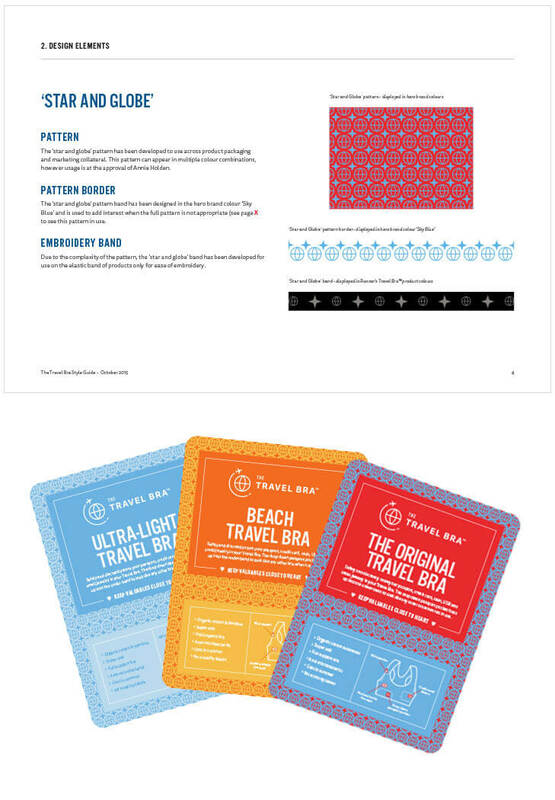 The Travel Bra is a client of ours who successfully uses a repeating pattern (developed from their logo) across their entire packaging range. Paired with their beautiful colour palette, it’s really effective. Illustrations should always have consistent line widths and colours and by setting these rules in your style guide, it ensures that illustrations and design elements that aren’t in line with your brand don’t make their way into your collateral. Photography plays an important role in the overall image of your company. We recommend organising a professional photoshoot for your products or if your business is service-based, have a photo shoot done in your workplace. If using stock imagery, be careful in your selections as it really can impact the look and feel of your business. Stock photos that are used time and time again will not set you apart from your competitors and will be really obvious to your audience. 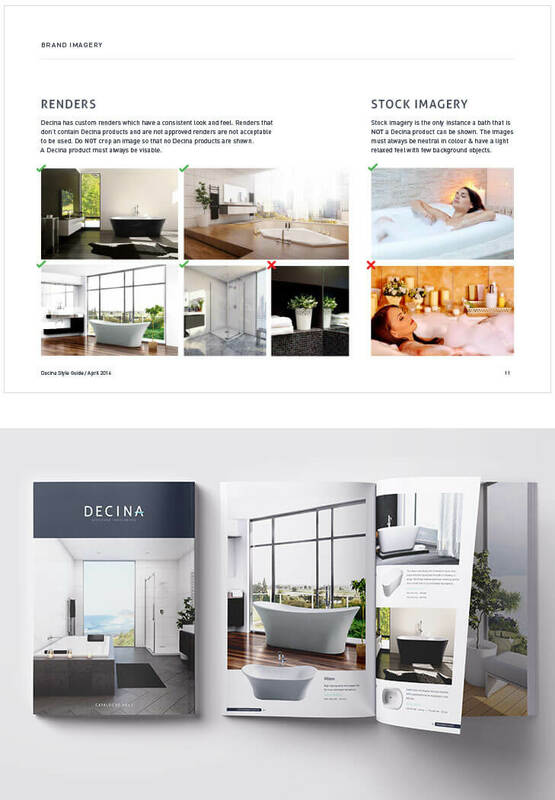 Renders may also be used – in a recent re-brand for our clients Decina, we ensured this was specified in their style guide, and it’s been successful in keeping the brand consistent and stylish! 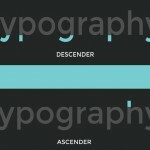 SO WHAT TYPE OF STYLE GUIDE DO YOU NEED? If you’re a small company you may only need basic guidelines such as logo usage, typography, colour and image guidelines. Medium to large companies may require a more in-depth document featuring stock imagery and photography usage, stationery, print collateral and digital guidelines. We often work with larger clients to design their branding and collateral and the style guide becomes a living document that is updated as the company grows and more design work is developed. Armed with these tips, you are now well on your way to develop a style guide to ensure your brand’s visual identity is crystal clear. 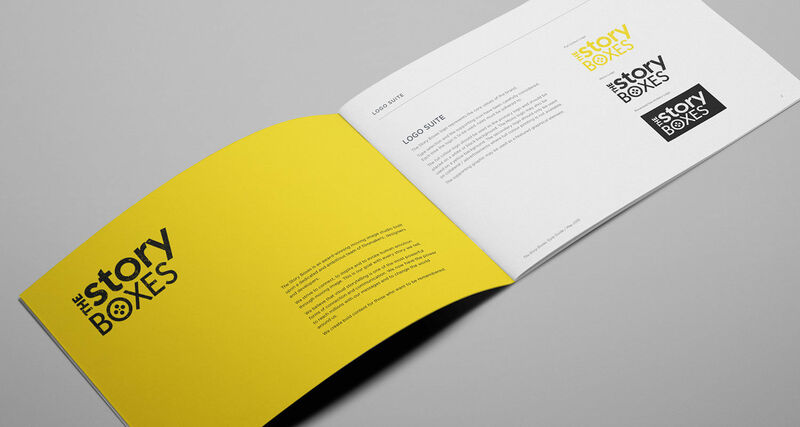 We can help you create a style guide that is easy to follow and will adapt and evolve with your brand… so get in touch!